Need some cute and adorable stickers or boy and girl leprechauns and frogs? This is a beautiful quality sticker sheet with lots of flowers, mushrooms, coins, pots of gold and shamrocks to use on your cards, scrapbook layouts, or to decorate lunch boxes or note books. 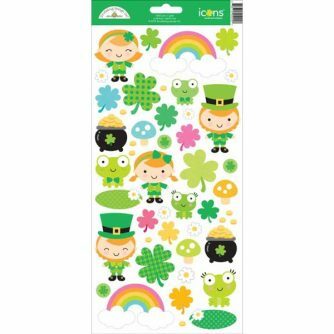 The images in this sticker sheet are shamrocks, boy and girl leprechauns, pots of gold, mushrooms, flowers, boy and girl frogs, lily pads, clouds and rainbows.